Literature is not immune to the lure of the listicle. I recently succumbed to the urge to click onThe 50 Coolest Books Ever. There are definitely some clever and hip books on that list, including On the Road by Jack Kerouac and Fight Club by Chuck Palahniuk and If on a Winter’s Night a Traveler by Itala Calvino. 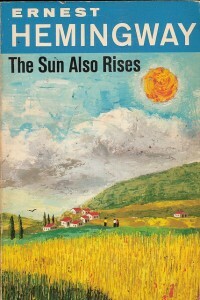 But the oldest of the 50 is Ernest Hemingway’s The Sun Also Rises, which just celebrated its 89th birthday. 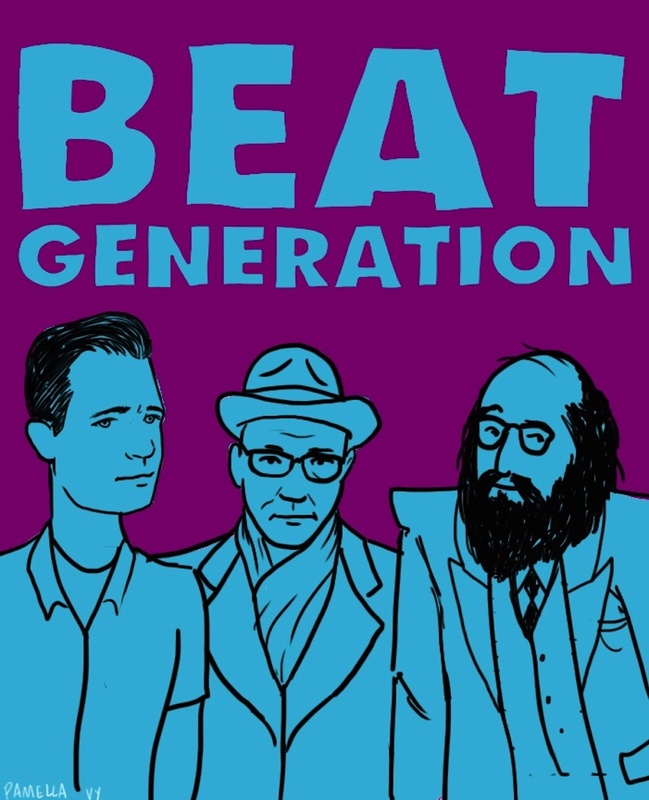 While 89 years might seem old for something labeled “cool” or “hip,” the coolest and hippest book of all time — yes, of ALL time — is more than 500 years old. Indeed, every story-telling device we label “post-modern,” every literary gimmick we crown as”meta-fiction,” every narrative technique we celebrate as “cutting edge” — yes, every single one of those “revolutionary” innovations — was first done by an author born in Spain in 1547. 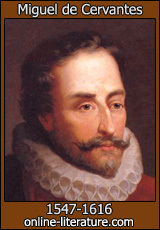 I refer, of course, to Miguel de Cervantes and his novel Don Quixote. The fact that Don Quixote is a great work of literature is hardly newsworthy. Indeed, it occupies the #1 slot in The Guardian’s ranking of the 100 Greatest Novels of All Time. And the fact that Don Quixote is an exceedingly clever work of literature is hardly a new topic for this blog. In a prior post I explored how certain of Cervantes’ literary inventions make postmodernist meta-fictions seem almost quaint. But I am enjoying anew all that coolness (and hilarity) as I listen to the audio version of the novel read by the great George Guidall. There are so many clever little moments in the book, one of which I share below. But first let me set that scene. Alonso Quijano, an aging landowner from La Mancha, has been driven insane by his obsessive reading of the tales of chivalry. 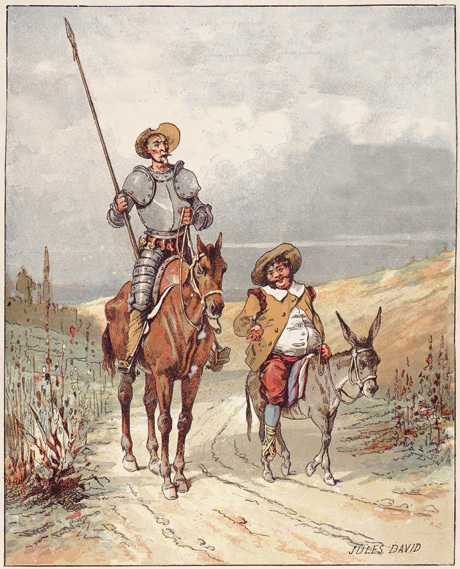 Resolving to restore dignity to the lost profession of knight-errantry, he dons a rusted suit of armor, anoints himself Don Quixote de la Mancha, mounts his spavined horse, which he has renamed Rocinante, and sets out in a quest for glory. When he returns from his first “adventure” badly beaten and nearly starving, his two closest friends in the village — the priest and the barber — decide they must “cure” their friend of his madness. Thus once Don Quixote has been put to bed, the two men enter his massive library to identify, remove, and burn every tale of chivalry on those bookshelves. One item regarding the author’s background before we turn to that scene: 20 years before publication of the first volume of Don Quixote, Cervantes published a pastoral novel entitled La Galatea. That book soon went out of print, and its promised sequel was never published. Now back to Chapter 6. Inside the library of Don Quixote, the priest and the barber take turns removing a book from the shelf, discussing it, and deciding whether it should be kept or burned. The various titles they deride, all bestsellers of that era, would no doubt have made Cervantes’ contemporaries chuckle; sadly, the humor is lost on us because those books have long since faded into obscurity. “La Galatea by Miguel de Cervantes,” said the barber. “That will be fine with me,” answered the barber. And we readers, smiling with amusement, move on to the next paragraph (and thus the next book on Don Quixote’s shelf), barely aware of the revolutionary bit of meta-fiction our author has just pulled off. So, okay, Hemingway was hip and The Sun Also Rises is cool. But try to add a scene in that novel where, say, Jake Barnes has come to visit Lady Brett Ashley. He walks over to her bookshelf, pulls out a copy of In Our Time, and the two of them start discussing the author. “For years,” Jake tells her, “this Hemingway has been a good friend of mine.” Well, you get the idea, right. Sorry, Papa. Don Quixote. Coolest book of all time.